Project Manager- Max Age 50 Years. Project Engineer- Max Age 37 Years. PhD in Concerned Discipline with 4-15 Year Post Qualification WOrk Experience. Project Engineer- Passed 1st Class BE/B.Tech/MCA or PG Degree in Relevant Discipline and 2-5 Year Post Qualification Work Experience. Project Officer- Passed Full Time MBA/CA/Hotel Management Degree in Concerned Discipline with 3-7 Year Post Qualification Work Experience in Similar Field. 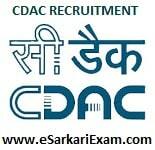 Eligible Candidates can Submit Online Application at the Official Website of CDAC Latest by 25th February 2019. Applicants First Open CDAC Official Website. Click on Current Job Opportunities Link. Click on CDAC Noida Various Short Term Projects Appointments Link. Open View Details Link for Eligible Post. Read Details and Check Eligibility Criteria. Save Copy of Application For Future Reference.